The Bureau of Land Management released final drafts today of proposed revisions to Obama-era greater sage grouse conservation plans that suggest removing hundreds of thousands of acres of federally protected habitat in Utah, and easing restrictions on energy development and other activities in Colorado, Idaho and Wyoming. Conservation groups and other critics immediately bashed the revisions, saying they're unnecessary and will ultimately drive the bird toward extinction to benefit a few states and special interest groups. But the six final environmental impact statements (EISs), like the draft versions BLM unveiled in May, do not automatically gut protections for the iconic bird, such as "no surface occupancy" requirements preventing bird-disturbing activities in priority habitat and buffers around grouse breeding grounds, called leks. Instead, the proposed changes to the original plans finalized in September 2015 give the bureau and individual states "flexibility" to allow for increased activity in grouse habitat management areas encompassing parts of Colorado, Idaho, Nevada/Northern California, Oregon, Utah and Wyoming. In Colorado, where BLM manages 1.7 million acres of grouse habitat, the current ban on oil and gas leasing within a mile of an active lek would be lifted, allowing such areas to be open to leasing subject to no-surface-occupancy requirements. In Idaho and Wyoming — which is home to a third of the bird's remaining population, and where BLM manages nearly 18 million acres of grouse habitat — no-surface-occupancy requirements in priority habitat management areas would be amended "to include the flexibility of an exception, waiver or modification process." In Nevada/Northern California, a system would be put in place allowing for the boundaries of priority habitat management areas and other designated grouse habitat to be revised without a lengthy resource management plan amendment process. It's not certain that any of these states would move on these proposals if allowed to do so. Furthermore, the true impacts of the changes are not likely to be known for years after the revisions requiring amendments to dozens of resource management plans (RMPs) are implemented. Still, the revised plans would remove almost all of the 10 million acres of so-called sagebrush focal areas, identified in the Obama plans as habitat critical to the bird's survival. The proposed final plans would leave 1.8 million acres of SFAs in Oregon and Montana. That is consistent with what Deputy Interior Secretary David Bernhardt told E&E News in May when the draft plans were released. The draft plans proposed to remove all 10 million acres of SFAs, but Bernhardt said there was a possibility some would be retained (E&E News PM, May 2). BLM says the final EISs and RMP amendments propose sensible tweaks to the Obama-era plans — most recommended by the individual states — that maintain strong protections for the bird while allowing other activities, such as responsible oil and gas development. "With today's action we have leaned forward to address the various states' issues, while appropriately ensuring that we will continue to be focused on meaningfully addressing the threats to the greater sage grouse and making efforts to improve its habitat," Bernhardt said in a statement released today. The six final EISs and proposed RMP amendments will be formally published in tomorrow's Federal Register, according to information on BLM's National Environmental Policy Act page. That will kick off a 30-day protest period running through Jan. 8 in which administrative challenges can be filed with BLM through a specific process outlined here. The governors in the seven states covered by the revisions detailed in the final EISs also have 60 days to review the documents and submit comments related to the plans' consistency with state laws and regulations. A final record of decision approving the revised plans is expected early next year. The Obama-era blueprint amended 98 BLM and Forest Service land use plans to incorporate strong grouse protection measures across nearly 70 million acres in 10 Western states. The Forest Service is separately evaluating changes to the grouse plans on national forestlands and grasslands. The overall plans were strong enough to convince the Fish and Wildlife Service in 2015 that the greater sage grouse did not warrant protections under the Endangered Species Act. But the Trump administration and other critics say the original plans unnecessarily hamper energy development, recreation and other uses of federal lands. BLM in October 2017 formally published a notice of intent in the Federal Register reopening the plans to public review, with the expected outcome that they would be significantly altered (E&E News PM, Oct. 5, 2017). When the agency released the six draft EISs and proposed resource management plan amendments last spring, many feared they would gut fundamental protections for the bird. For the most part, however, the proposed revisions do not simply dismantle the grouse conservation plans but do propose some significant revisions that, based on how they are implemented, could affect the grouse. For example, in Utah, where BLM manages 2.5 million acres of grouse habitat, the final EIS calls for removing 448,600 acres of "general habitat management areas" and "reverting" back to what management criteria were in place before the Obama-era plans were adopted. In Idaho, where BLM oversees 8.8 million acres of sage grouse habitat, the revisions call for modifying buffers around leks. Existing buffer requirements would be eliminated altogether for leks within general habitat management areas. Overall, most of the governors in these states said they support the proposed revisions orchestrated by Interior Secretary Ryan Zinke and Bernhardt. "This is a great example of federal leaders listening to state leaders, valuing their expertise, and changing their plans based on that input," Utah Gov. Gary Herbert (R), a vocal critic of the Obama plans, said in a statement. "It is refreshing to have a federal agency willing to listen to the people in Idaho on an issue so important to our state and the West," Idaho Gov. Butch Otter (R) said in a statement. Colorado Gov. John Hickenlooper, a Democrat, echoed Otter and Herbert. "We worked with the Bureau of Land Management and our stakeholders to produce a plan that maintains protection for the sage grouse while balancing the potential impact on local economies," Hickenlooper said in a statement. "This is a significant step that closes out the planning phase and allows us to begin to see the true conservation efforts that safeguard the sage grouse in Colorado." Wyoming Gov. Matt Mead (R) said the revisions in the final EISs establish "better alignment between state and federal management for the bird." "I thank the Department of the Interior, both locally and nationally, for working with Wyoming throughout this plan amendment process," Mead added. But to conservation groups and other critics that hailed the original plans finalized in 2015, the revisions are an unnecessary move that ultimately will weaken protections and eventually drive the bird toward an endangered listing. The Obama administration spent years working with states, the oil and gas industry, ranching, and other stakeholders to develop a workable plan to save the grouse and avoid an ESA listing. 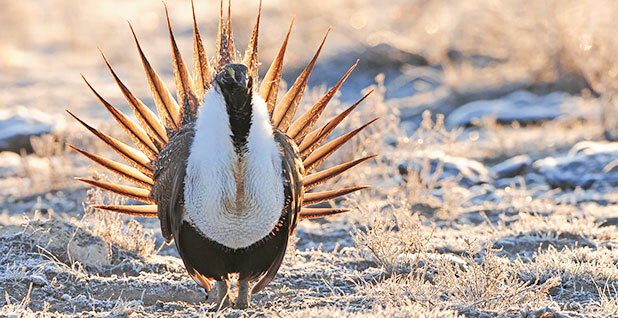 "This administration's goal has been clear from the start: expand oil and gas drilling in sage grouse habitat, regardless of the consequences to wildlife and wild lands," said Mark Salvo, vice president of landscape conservation with Defenders of Wildlife. "None of the proposed amendments would actually improve sage grouse conservation, and most of them would undermine years of investment and progress in sage grouse conservation at a time when the species is facing acute threats across its range," Salvo added. Bobby McEnaney, senior director of the Natural Resources Defense Council's Western renewable energy project, agreed. "This rolls back a conservation plan that was carefully crafted by states, ranchers, conservationists and public officials to protect this iconic western bird and the unique sagebrush landscape it inhabits," McEnaney said in a statement. "Zinke's move to unravel it is his single largest land use decision to date. It has no basis in science — it's a bald-faced giveaway to the oil and gas industry." Nada Culver, senior counsel and director of the Wilderness Society's BLM Action Center in Denver, said the proposed changes send a "harsh message" to those who worked for years to craft the plans, "only to have much of it tossed aside by an administration that has made a habit of disregarding and even discarding public input." Others took a more nuanced approach to reading the revised blueprint. Among them is Whit Fosburgh, president and CEO of the Theodore Roosevelt Conservation Partnership. "These new plans are a mixed bag, with some changes addressing legitimate requests from the states to help align with their conservation approaches and other changes stripping back protections for core sage grouse habitat and creating more uncertainty for the West," Fosburgh said in a statement. His chief concern is mitigation for habitat damage and destruction, which BLM is proposing, for the most part, to have individual states handle. "Unless the impacts of development are properly mitigated to avoid further habitat loss, sage grouse could easily become a candidate for the threatened and endangered species list yet again," he said. Successful protection of the bird "will ultimately come down to implementing these new plans," he added. That's what the National Audubon Society will focus on now, said Brian Rutledge, director of Audubon's Sagebrush Ecosystem Initiative. "A fractured approach to sagebrush conservation will not work. The best chance to protect sage grouse and more than 350 other species is through a landscape-wide conservation strategy, which is what we achieved in 2015," Rutledge said. He added, "Regardless of today's decision, Audubon and our partners remain committed to protecting this irreplaceable landscape and will remain at the table to ensure future generations can appreciate this truly special and underappreciated place." Click here to access the six final EISs and proposed resource management plan amendments.